We’ve all heard of the parking nightmares that are part of daily life in San Francisco, Los Angeles, and New York. But, in Honolulu? Yep, sometimes I have to remember we live on an island, and there’s only so much space available (plus, Honolulu is the 12th largest city in the U.S.). Add to that the extra rental cars on the roads, and you have a recipe for a major parking problem. 1. ParkMe: Parkme.com gives users a few ways to find parking on its website. When you open the site, you can type-in your destination OR choose from some pre-selected popular venues. Just provide your dates and times you’ll need parking, and you can see the available lots that are nearby. An added bonus: The site tells you how long it will take you to walk from parking to your destination AND all rates (including times and days you didn’t initally request). And, of course, it tells you if there are open spots at the time you requested. Overall, a great website if you need parking and nydon’t mind walking a bit to your destination (company also has an available app). 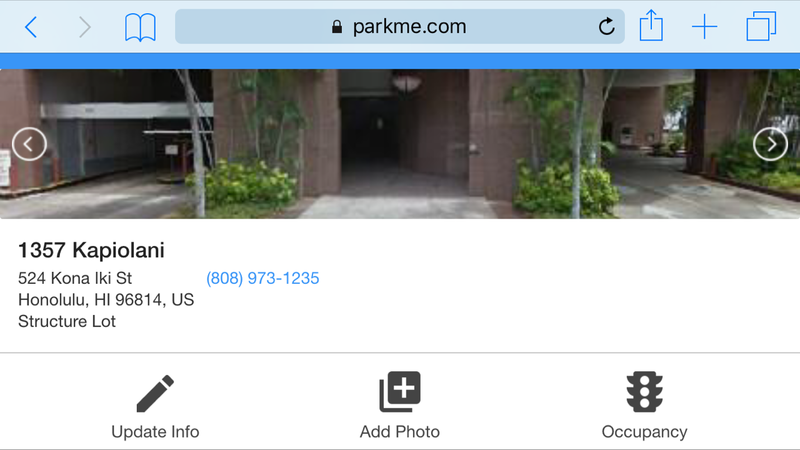 At parkme.com, you can also get a visual photo of the parking structure, so you know you're at the right place! 3.Parkopedia: Parkopedia.com seems to combine some of the best features from ParkMe and BestParking into one website. Not only do you have a map with the pop-up feature for easy navigating, but you also have walking distances provided from the parking space to your destination. I didn’t see a feature in which you can enter your dates and times, so all info is non-specific. But, if you click on the pop-up, you can view all the details about the parking space, such as hours of operation, price, etc (company also has an available app). 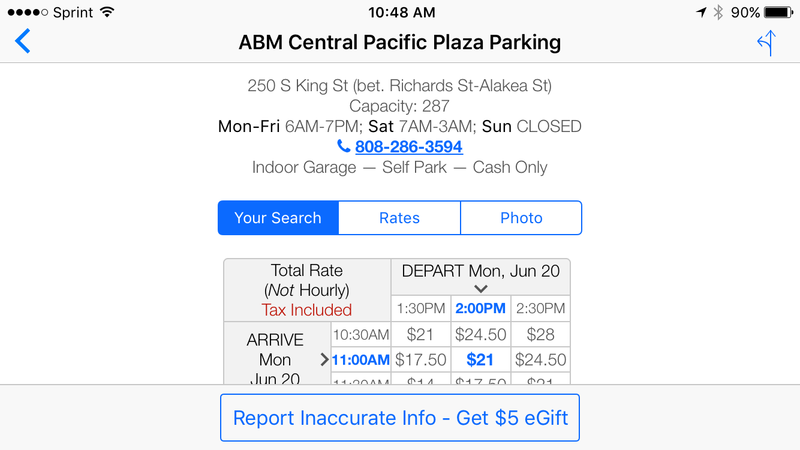 At bestparking.com, you can see parking details, that include time, place, phone number, price, and price variations. Of course, there is another solution to the problem of where to park in Honolulu: Don’t rent a car. Instead, you can certainly get-by using taxis, The Bus, or even the Waikiki Trolley. Or, better yet, consider booking your activities through Hawaii Aloha Travel — many of our Hawaii activities, such as the Aloha Plate Food Tour, Oahu Parasailing, and the Oahu Paragliding Experience have transportation included in the price of tickets. So, you don’t even need to worry about parking! Bottom line: Parking can be a real hassle in Honolulu, especially during peak visitor months, days, and times. So, save yourself the trouble of wandering aimlessly in your rental car looking for a space, and check-out some of these parking websites. That way, you have more time to enjoy amazing Honolulu!